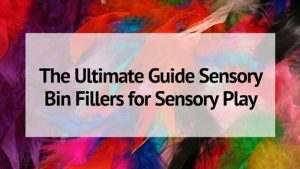 Giving your kids sensory experiences doesn’t have to be expensive. 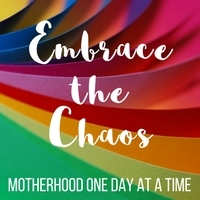 It doesn’t have to be a big ordeal to plan and carry out. 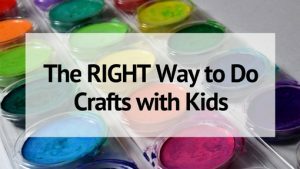 Sometimes the best sensory play ideas use things that are right in your home. 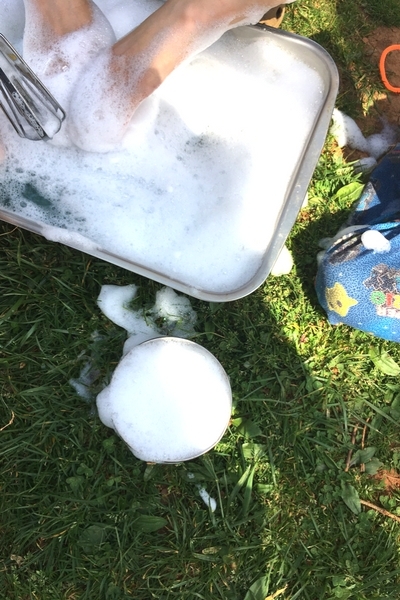 This water play activity is so much fun for kids of all ages- I had kids ranging from 2 to 12 with their hands in the soapy water. All having just as much fun as the next. I bet almost everything you need for a fun water play sensory experience is already in your kitchen- so let’s have some good clean fun! 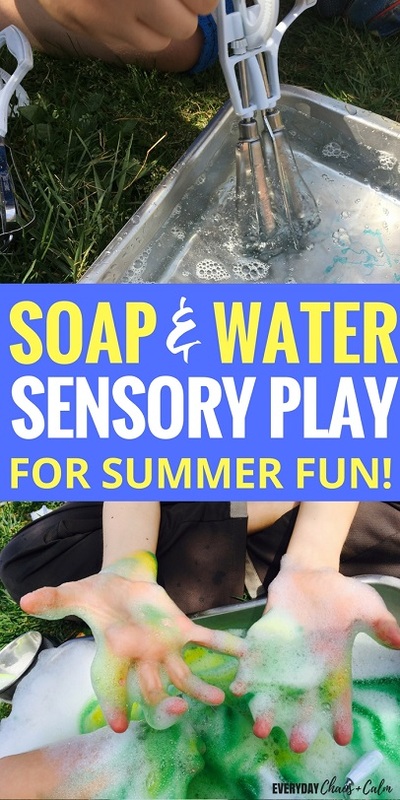 The Ultimate Soap and Water Play Sensory Experience for Kids! 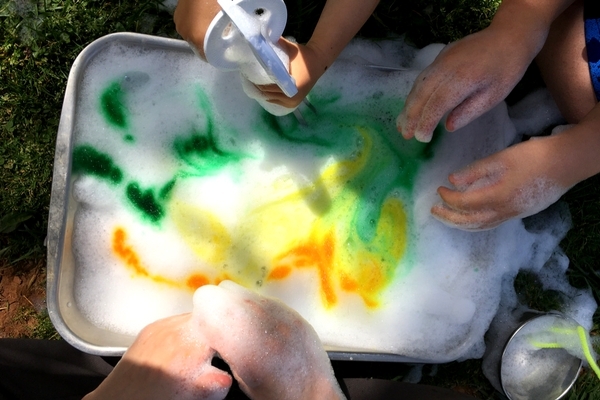 So, all you really need for this water play activity is a pan of water and some soap. But it’s the extras that make it more fun! My larger tubs are currently in use, so for this water play I just used my big roasting pan from the kitchen. The same one the Thanksgiving turkey gets roasted in. Then I grabbed the dawn dish soap. I think the most fun part of this activity is the egg beaters. They work really well to get a LOT of lather going in the water. They are kind of tough to use too, so the kids a work out in those small hand muscles. 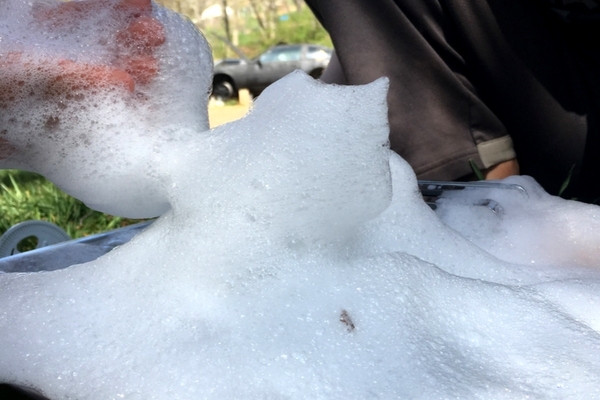 You’ll need a good amount of soap to make a lot of bubbles. And the more bubbles the better! You can add whatever extras you like. I’ve got boys so there’s bound to be cars in any activity we do- so a car wash was, of course, added to the water play. A baster was a very fun addition too. For blowing bubbles and sucking up and spraying water. My older kids made a few bubble blowers out of pipe cleaners to try and blow bubbles with the soapy water. We also added drops of liquid food coloring for an extra sensory experience. 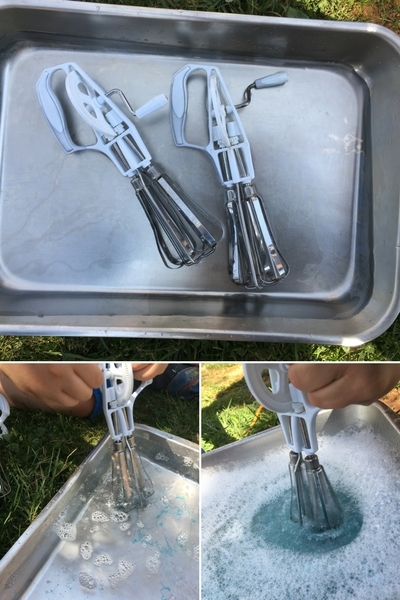 We dropped coloring on the top of the bubbles and then they used the egg beaters to swirl and mix it together. It added a new exciting element to their play. 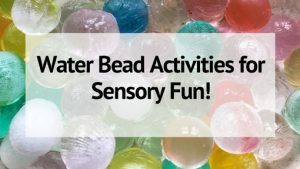 This water play sensory activity held all of the kids attention for a good hour. And it was a great, low-key, inexpensive way to spend a warm afternoon. Whats better than spending an hour outdoors, in the shade of a tree, with your hands in a pile of soap suds and water! Check out my Yellow Sensory Bin and Square Sensory Bin for more sensory activities for kids!